Oran Mor Scottish Ceilidh band from Troon, Ayrshire in the South West of Scotland. 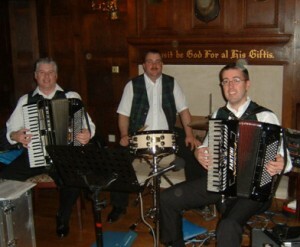 The band is led by Roy Hendrie a former British Champion Accordionist who has established Oran Mor as one of the country’s top ceilidh dance bands. Whether i’ts your Wedding, Birthday, Anniversary, or Party, Oran Mor can provide a dance band of various sizes ( from 2 to 6 piece ) to meet your needs and budget. Roy has broadcast solo and with his band on numerous occasions with BBC Radio Scotland’s “Take the Floor” dance programme and a live TV broadcast on BBC1’s “MOD” programme. As with all good Ceilidh bands, Oran Mor stick to what they are well known and respected for, providing top quality music with dance instructions. If you require a disco to split the evening, we can arrange this for you or put you in contact with good DJ’s that we regularly work with. Oran Mor also play regularly for Scottish Country dancing ( RSCDS ), Old tyme and ballroom. Oran Mor typically play in the South West of Scotland and Central belt covering Glasgow, Edinburgh, Stirling, etc. but will travel mostly anywhere. For people looking to book them as a Wedding band, they have public liability insurance and PAT tested equipment which is now a requirement at most hotels.